Harriston Village Hall in Harriston, near Aspatria, are a Charitable Incorporated Organisation (CIO) in their third year of operating. The CIO was formed in 2016 to apply for the lease and secure the future of the Hall. The CIO is led by a group of trustees there to make sure the Village Hall is there for future generations to use and that it remains at the heart of the village. The Hall is one of only two original buildings in the village and a thriving venue offering a range of activities; Private Parties, Prize Bingo, Table Top Sales, Halloween Parties, Children’s Craft Club, Coffee Afternoons, History Project etc. Harriston Hall CIO has an ongoing list of repairs and jobs that are set out in priority. Doors which needed attention were becoming such a problem that it was meaning they could not be used easily, the drainpipes were in need of vital repair because of the amount of water that was not being directed away – a must in Cumbria’s climate! The trustees decided that instead of submitting a “Support Wanted” to Cumbria Exchange they would take up an existing “Support Offered” from PPM Ltd in regards to offering help to Community Projects. PPM gladly agreed to provide support. “The work which was carried out by PPM Ltd, has helped so much, they have made sure the doors open correctly, and the drainpipes they fitted have made sure all the rainwater is directed correctly, this has also helped to stop / reduce any damage. PPM Limited are a local Cumbrian based property maintenance company that provide services to local housing associations, councils and private clients throughout the county. PPM offer the services of their skilled trade workforce to assist with maintenance that organisations may need help with. PPM have a Volunteering Scheme which allows each of their team members to take a day’s paid leave to use their skills to help a local charity or organisation. 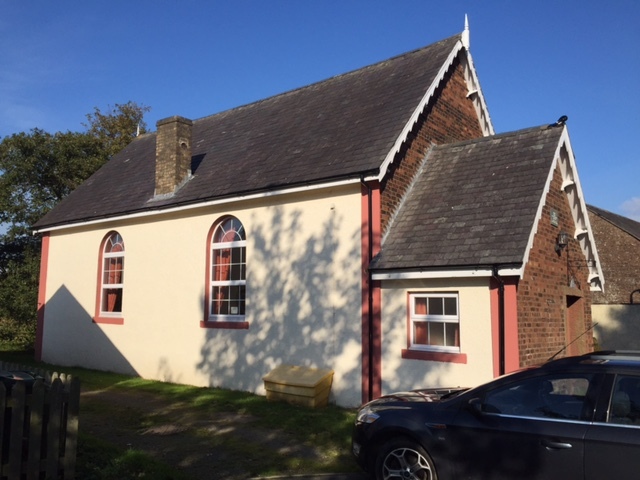 “We were delighted to be able to help Henry with the works at Harriston Village Hall as we understand the importance of being able to save as much of their funds as possible so that they can concentrate on providing the fantastic range of activities that they offer to the local community. It is a real hub of the community which we work within so an ideal project for our skilled trades team to support. Our PPM volunteering scheme is a real success and benefits both the local communities that we work within as well as our team members that take part. Removal and rehanging of the internal doors. Fitting of drainpipes to ensure water drains away correctly, preventing water ingress and damage to the Hall. The Hall is well maintained and funds can be saved to be directed at providing activities for the local community.